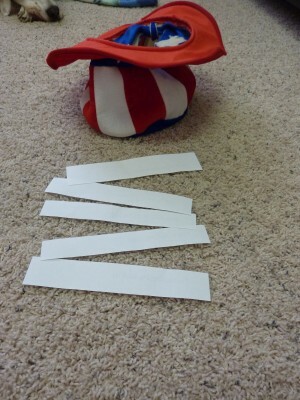 Fourth of July hat “Search and Find” is a modification of the “St. Patrick’s Hat Search and Find” I posted on in March. This version uses a July themed hat (think Uncle Sam and parades!) along with some different textured items. 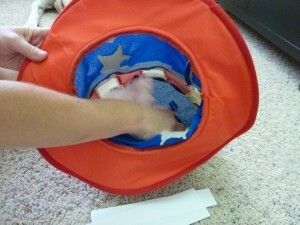 I liked this hat because it was deep enough to put items in so the child cannot see what is in there. They have to use their sense of touch and also think about what the items feel like, connecting the feelings with words. This was something I did with Andrew early on to see if he understood words that described the feeling or texture of something. If he did not, this was a perfect opportunity to teach the word since he could make the direct connection between what he was feeling and the word I was using to describe it. 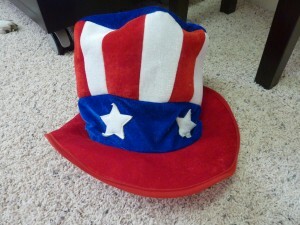 Fourth of July themed hat. As I will often do for station activities, I went on a little treasure hunt around my house to see what sorts of things I could find that had unique or different textures. A good place to look is a scrap bin or catch-all box if you do arts and crafts or the crafting aisles at Michael’s. 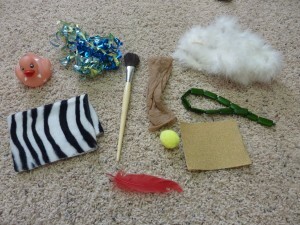 Pictured below are some of the items that I gathered up for our My Obstacle Course. 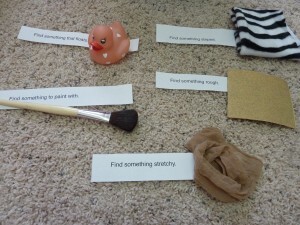 Some different textured items for this activity. 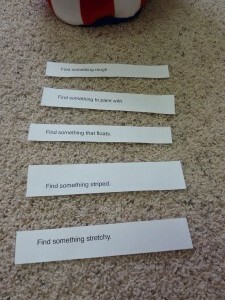 I typed up and printed out some basic instructions each beginning with “Find something” to help build literacy skills. These could be printed out on pieces of paper or index cards but I like how quick it is to just print and cut them into strips. Do whatever is easiest for you! Station all set up and ready to go! I like to turn the strips of paper over to make it more of a game and allow him to choose. 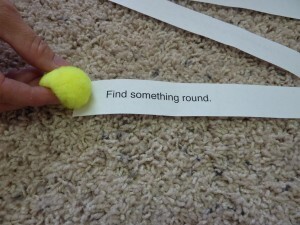 First thing to find is something round. Reaching into the hat, but no peeking!! 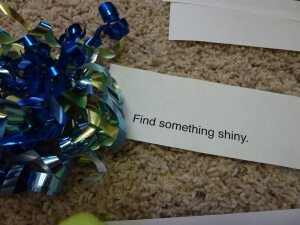 Keep in mind that if your child needs to look to find it, that is okay! This is a fabulous opportunity to help them build their knowledge of specific, descriptive vocabulary right along with something real that they can touch. A colored puff is round (when I'm not squishing it 🙂 )! Something shiny - a ribbon bow for a gift. 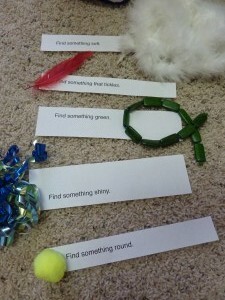 Items matched with descriptions for one "Search and Find" station. We began basic with very different kinds of textures and progressed to being even more specific in choosing the best item to fit a description. 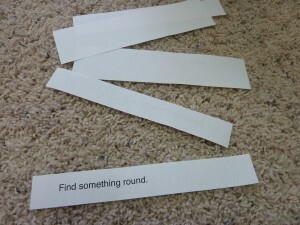 This basic activity can be adapted in so many different ways – I love things like this! !